The Axe (The Master of Hestviken, Vol. 1) by Sigrid Undset. Vintage, 1994. These subdivisions were published in four paperbacks from 1994-1995 by Vintage, with such beautiful cover art by Kinuko Craft. My first copy, however, was a Plume (New American Library) paperback, complete in one volume, published in 1978. Its cover has more of the Viking flavor. I’m so glad to finally read it! It is a complex novel with many characters but the actions and beliefs of Olav drive the story. It takes place during the 13th century when the Christian faith was still young in Norway, beginning to transform people’s lives and sense of themselves more fully. Olav must deal with his own guilt and the consequences of a decision to conceal a killing, as he faces the contradictions in his passionate relationship with his wife Ingunn. Undset, a recent convert to Catholicism herself, portrays compassion and mercy in action among the churchmen and shows the struggles of a good man, Olav, living in the often violent world of medieval Norway. Undset’s women characters, such as Ingunn and Kristin Lavransdatter before her, are strong and independent; these traits are much more than words, but demonstrated over and over again, in the crucible of many troubles. Undset shows us so much–the whole arc of a life–with its times of growth, setback, sorrow, and joy. I will add to this review as I read the first volume, The Axe. 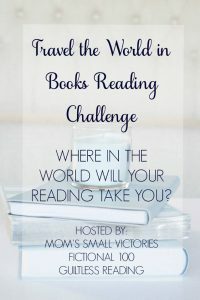 This book choice is part of two long-term reading challenges, Travel the World in Books (which I host along with Tanya of Mom’s Small Victories and Aloi of Guiltless Reading) and Read the Nobels hosted by Aloi. I am so grateful for the abundant creative energies of these women. Sigrid Undset won the Nobel Prize for literature in 1928; she was only 46 years old, and the third woman to win (the first two were Sweden’s Selma Lagerlöf and Italy’s Grazia Deledda). Visit Guiltless Reading for more information about the combined challenge, including an Instagram challenge, during the month of April. This entry was posted in Historical Fiction, Literature and tagged Medieval, Norway, Read the Nobels, Reading Challenges, Reading Plans, Sigrid Unset, The Master of Hestviken, Travel the World in Books. Bookmark the permalink. I haven’t ventured into any of Undset’s work but these seem to have the same draw of LOTR. I think once you read the first, you won’t be able to stop until you’ve read them all. The covers so remind me of classical art and I’m glad that you’re reading something less “obvious”. I’ll be happy to read your thought about The Axe. I may think about leaving my Latin men for a while and go into some more unfamiliar territory!